I thanked him for the support the night before, and for finding a place to leave my phone charging overnight. “I’m not really sure what I’m going to do, get some food then decide I guess” I finished with, as I headed back towards the canteen. Unfortunately, the phone was looking pretty terminal – it’s battery indicator was showing only 7% despite being on charge for several hours. It wasn’t close to enough for a call home, and I really wanted to speak with Yoli – her support had been a major part of getting me this far, and I needed to let her know that my LEL might be done. Not really wanting to accost a random rider to borrow a phone for a call to South Africa, I scanned the canteen for a friendly face. By an amazing stroke of luck, one of the Cox brothers was sat at a table – I seem to recall it being Gavin. After a rapid summary of my predicament, he was only too glad to lend me his iPhone. I sat a couple of chairs away at their table and made the call. I was choking back the tears as we spoke – I knew Yoli would have been able to hear my voice cracking at the disappointment I was suddenly faced with. I explained the events of the night before, that along with my severe neck pain I’d also suffered illness throughout the night. I told her my doubts about being able to carry on, especially with the forecast for a high of 38 Celsius and strong headwinds. It was going to be a tough day in the saddle even without the the small matter of 268km of riding between here and the finish, almost exactly the distance of my longest every ride prior to LEL. Yoli listened, sympathetically, telling me she was proud of me and that whatever I did she knew I’d make the right choice. I signed off saying something along to the effect that I’d promised her I wouldn’t risk my health or safety, and that I’d make my ultimate decision with that at the front of my thoughts. Handing the phone back to Gavin with profuse thanks, I went off in search of food. There wasn’t any. A few canteen staff were standing around with folded arms, one of whom directed me towards some muesli, there may also have been some toast, I forget. Funnily enough, it happened to be almost exactly what I fancied. I smothered it in milk, and grabbed two cups of tea, each with three sugars. There being no obvious cutlery around, I hung onto the white plastic teaspoon to eat the muesli with. Returning to the table to eat it, I felt a bit like Alan Sugar on his “small fork” diet. It was slow progress. I forget whether Gavin told me directly about Gillian suffering some pretty horrendous saddle sores, or whether I overheard him mention it to someone else. Either way, it sounded like I wasn’t the only one suffering to battle through this. The food and tea was starting to make me feel whole again and a familiar and friendly face sat down next to me. It was the first aider from the night before. He was about to sign off and head home, and wanted to wish me luck and also get my rider number so he could check in on my progress. C71 I told him. I couldn’t be sure of my next move, but we parted with a handshake and my profuse thanks for helping me get through such a bad patch. The wonders of social media came to my aid again after the ride – his name was Peter Davis, and he responded to my Facebook message of praise for how he and the Market Rasen staff had taken care of me through my lowest point. Sitting there, feeling considerably better, it occurred to me what a pain it was going to be to get to a station and then get back to Loughton via Central London and gather up all my things. It would be easier logistically, if not physically, to simply cycle through to the end, even if I didn’t actually manage to do it in time to officially complete LEL. I remembered the wise words from an LEL Facebook forum member posted just before the ride. He made the observation that it was not a rider’s job to call time on his own ride – that was the job of the controllers. His view was that as long as the rider weren’t mechanically or physically incapable of continuing, he should just ride on, forgetting about the clock until someone else told them they must abandon the ride. The words seemed to fit my situation perfectly – I was a long way short of 100%, but there was nothing really to prevent me from getting back on the bike and riding on. I may be now behind the clock, but that didn’t mean I should be declaring myself out of time. We weren’t at that stage yet, and that wasn’t my decision ultimately. 05:35 - Rob Walker: 2% battery. I may try ride to Kirton. I wouldn’t see the reply until the next control. I wasn’t exactly in top spirits, but I donned my still damp shoes and headed out to the bike park anyway. There were very few bikes and riders left, and those that remained were mostly in various stages of preparing to leave. There was no doubt about it, I was now very much in the tail of the ride. The “bulge” was already down the road on it’s way through the last few controls. I pedaled slowly out of the control, my mind already starting to turn over calculations of distances and average speeds. It didn’t take long to work out that if I rode sensibly, I still had plenty of time. From the experience of the last few days, I knew that a steady 20Km/h wouldn’t take me anywhere into the red zone energy wise, and the lack of any big hills from here home ought to prevent too much added stress on my neck. Despite leaving the control almost an hour behind schedule, at that average riding speed I would have a startlingly large 8 hour buffer before I’d be out of time. Heat and headwinds would eat into that but would only really affect my average speed for around 3 or 4 hours across the middle of the day. I’d need to eat, stop for occasional rests, and keep my faffing and inefficiency at controls in check but, to coin Andy Alsop’s phrase, barring mechanicals I should be OK. All I needed to do was ride myself steadily back into this ride. I soon came upon almost the perfect vehicle to help me with that. Ahead was a group of four riders, whom I initially took to be Italian from their jerseys and shorts. They rode like a perfectly conducted symphony, meting out an unvarying tempo regardless of undulations in the lane ahead. I was just beginning to imagine comparisons with a well tuned Ferrari when it struck me that their conversation did not actually sound remotely Italian. Whatever phrase they had used for “car back“, it had most definitely not contained the word “macchina“, or even “auto“. If my mental faculties had been more alert I’d probably also wondered why they weren’t all riding Campy groupsets. They were in fact Polish, as confirmed by the PL on their LEL which became visible on one of the few occasions I took a turn at the front. Regardless of mostly being a wheel sucker, they didn’t seem to mind my presence, even though I don’t think they understood me asking if it was ok for me to ride with them. The steady 21 to 22Km/h paced out over the opening kilometers of the leg worked wonders for my spirits. By the time the guys pulled over for a stop, I’d gone beyond a theoretical calculation showing me I had time, to actually believing I was capable of the average speed needed to achieve it. I also stopped once or twice on the way – one of these I remember was on the outskirts of Woodhall Spa for the last of Vicke’s codeine, some snacks, and a drink. 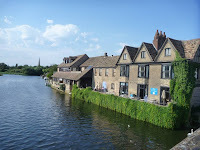 Soon after came the enjoyable stretch along the banks of the River Witham, which I remembered well from the ride north. It was still cool, and there was no wind hampering my progress at this stage. I chatted briefly with another rider who was suffering neck problems. He was a generally faster rider than me, but was finding a regular stop and few minutes walk was helping to stretch out the aches. 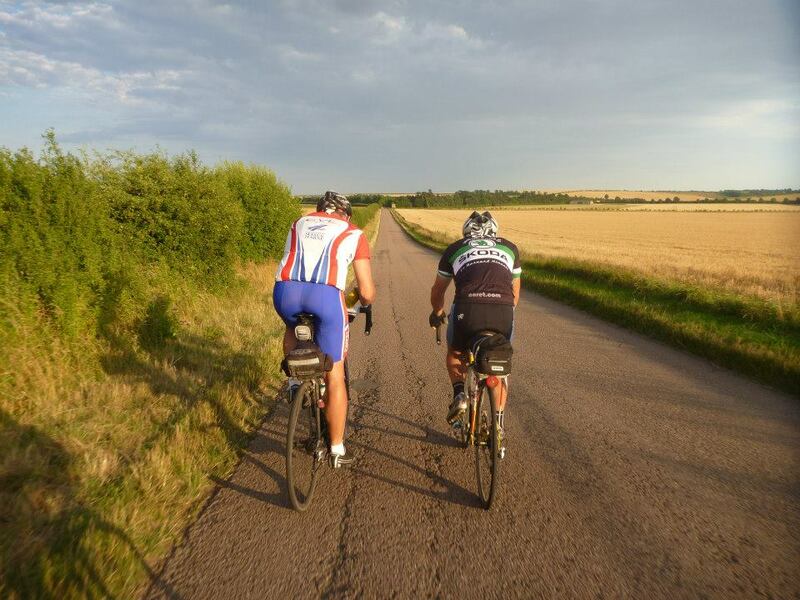 As a result, we passed each other a few times along the predominantly flat and straight Fenland roads. Before long, I was at the control. I’d need to make a decision soon, but for now I could grab some food and a few minutes relaxation. Luckily the Kirton canteen still had plenty of food, and I filled my tray with pretty much anything they had on offer. As always there was pudding with custard, and hot sweet tea. I also remember a large mountain of potatoes, covered in gravy, the rest is a blur – I’m sure there was some form of meat too. I swapped a few words with Leslie too on the way to sit and eat. She sounded tired, mentioning something about Susan being around too, but I forget exactly what. I sat and ate opposite with my fellow neck-pain sufferer. We swapped war stories, and the benefits of an ice cream stop were recommended to me. I resolved to make that my first leg stretch stop after the control. Too my surprise, I noticed whilst eating that my phone had actually charged up a few percent. I’d connected it back up more out of routine than any actual thought it would revive, but clearly being switched off had meant that the charge available could go in without being used up. For some reason, I thought I had I typed out a short message to let Yoli know I was doing, but it turned out later that either I hadn’t, or it didn’t get through. I’d struggled with cellphone signal at Kirton on the way up, so perhaps it wasn’t just slackness from my tired mental state. I really wasn’t looking forward to the next leg. The night before, a part of me had considered riding on from Market Rasen to sleep at Kirton, and hence position me for riding the stretch to St Ives in the cool of the morning. Instead, I’d be riding across it in the heat of the day, and with a strengthening headwind. I couldn’t have misjudged it more, and was kicking myself for my poor decision making. Recriminations weren’t going to help now though, all I could do was deal with the conditions ahead, and I set out to do battle with them. Time of departure from Kirton 10:06 – back on track, 200 to go! The good part about the leg to come was knowing that it would be tough, but that once done, the remainder of the ride should be in cooler air and without the wind. The next 80Km really were now the crux of the ride – if I could just slog through them, even at a very slow pace, I should be almost there. The afternoon and night before had done their best to bring me down and end my ride, but somehow I was still in it, the kilometers were still gradually passing by under my wheels. I wasn’t feeling much better than I had the day before, but I wasn’t feeling significantly worse either – the pain had peeked, and I was finding ways to ride with it and keep going. There was only a Double Century to go now! I started looking forward to that ice cream – it would make a nice break off the bike. But my recollection of sheltering from a shower at a garage on the way up was clearly faulty – it wasn’t on this stretch. There was an old filling station that had now been converted to a carwash though, and that served the job just as well. It turned out the owner had served a steady stream of riders, and knew a fair bit about our adventure. By the time I was standing outside stashing snacks in my bags, sipping coke and eating a Magnum ice cream, there were several other riders pulling in with the same idea in mind. Predictably, the dead flat stretch along the banks of the Welland was where the wind really started to kick up. An express train of around eight or ten riders blasted by, calling for me to latch on as they passed. Several other riders that I’d seen apparently struggling along solo had joined them, and for a second I contemplated hitching up too. The pace was way too hot though. I might have been able to keep it up for a few kilometers, but the exertion to do so might finish me once and for all. Slow and steady was really the only bet that seemed remotely likely to get me to the end. I watched them disappearing ahead – somewhat envious of their shared effort working against the wind. Rising up onto the embankment for the last few kilometers before Crowland, there was simply nowhere to hide from the onslaught. My speed was down below 12Km/h at times. I had to keep telling myself it didn’t matter, it might be too slow, but it wouldn’t be for long enough to do significant damage to my hopes of finishing in time. I was contemplating a stop for a break when a passing rider reminded me that Crowland was not far ahead, with a convenient shop in the middle of the town. It was all the motivation I needed to push on. I focused my vision on the water tower that marked the end of the stretch along the navigation. It seemed to take an eternity to crawl to the distant landmark, but eventually I was there turning left up onto the bridge across the waterway, and winding into the town. The yard of the shop was mobbed with fellow cyclists – it was a very welcome sight. I pulled over, and headed inside for snacks, cold water and more coke. Back out by the bikes I emptied several shakes of the ice cold water over my head and jersey. I’d noticed another rider doing it, and it was an instant cooling relief. I also spotted my mistake with the missing phone messages to Yoli. She hadn’t received anything from me from Kirton. I kicked myself for my mistake, and hastily responded. The remaining stretch to St Ives just got kept getting hotter and windier, but I had the most amazing piece of luck along this section. I met up with a chap from Spain in a Madrid shirt, Jose Manuel Andrey. The wind was so strong it had blown his map away. He offered to help break the wind for me if I’d help navigate through the turns and towns. I was really beginning to struggle and it was about the kindest and most timely offer I could have imagined. I also felt a bit of a cheat accepting it too – he’d be working much harder against the wind that I would following a wiggly line on a GPS display. I didn’t refuse though, and before long we were chatting away and it was great to also have some friendly company. At some point ESL (Damon) pulled alongside us with his motorbike. With a camera mounted to his handlebar he was surveying how riders were doing as he passed. I mentioned something about this man saving me by breaking the wind, and me route finding in return. I’m sure it was largely unintelligible and went straight to the cutting room floor. We pulled over for a brief stop, Manuel had some Voltarin gel he thought would help my neck. With yet more generosity, after a good smear, he insisted I keep the jar for later. I pulled out a spare water bottle from my saddle bag to top up Manuel’s now almost empty bidon in return. Not far down the road was a shop, and we pulled over to grab snacks – I went immediately for the chocolate milk, more water for my bottles, and I think a chocolate bar or somesuch. Back outside to enjoy the stop, I finally met Phil Whitehurst in the flesh – rider T45. We hastily caught up on each of our rides. I felt rather guilty at having to rush away so soon, but with time ticking I didn’t really have the luxury to linger too long. With his T start letter, Phil had at least a couple more hours in hand than I did, and from his anecdotes, it sounded like he was now over his physical adversities and was going well. Wishing each other luck, our paths diverged again. The rest of the leg was a long slow slog against the wind and the heat. I took some turns at the front – even with my neck pain, I simply could not just sit behind doing none of the work. Rather oddly, I seemed to have plenty left in the legs on the few inclines towards the end of this leg. So much so that it prompted Manuel to comment that my legs were still strong for the climbs. I took the lead over each of the short rises after that, happy to find some part I could pull my weight. We had at least one more short stop to get a break from the hot sun. We found a welcome bit of shade on the verge by someone’s front lawn – Manuel sat and relaxed, while I paced and stretched. It strikes me now just how many stops I’d had on this leg, an indication of just how much my body was now suffering, and how tough the leg had been. Eventually, we pulled into the outskirts of St Ives. I started to believe again. The leg behind was surely one of the toughest, and I had got through it. I mentioned to Manuel that I was contemplating getting half an hours sleep here to allow the temperature to drop and wind to die down before embarking on the last couple of legs. It seemed he’d had exactly the same idea. We parked our bikes and headed into the control, glad to be leaving the heat of the day outside for a while. Card stamped, both Manuel and I booked wakeup times with the volunteer on the control desk. I grabbed a drink, and we were shown to our mattresses in the dorm. The hall was warm and a little stuffy, the upside being that I could use the blanket as a pillow rather than needing it for warmth. I tapped out a quick message home. 15:43 - Rob Walker: Struggling but. Trying hard. 38c heat not helping. Made St Ives. Sleep came almost immediately after Yoli’s reply. As at Barnard Castle, the short cat nap was just enough to freshen body and spirits. I lay on the mattress for a few moments after my wake-up nudge, contemplating how far I had come and how little there was left. I resolved to use the time I had in hand and savour as much as possible of the few remaining kilometers. Sweeping up my stuff, I made for the canteen to grab some tea and food. I didn’t really have a huge appetite, so I opted for light snacks. One of the volunteers also showed me to a hidden stash of bananas and cereal bars. I’m not sure why I’d been singled out for the VIP treatment, but it was very welcome. Sitting to eat, I resumed my text conversation with Yoli. 16:50 - Rob Walker: Puff puff puff. Little engine filling with tea & snacks to get me on way. Refreshed and fed, I headed to the bike. It occured to me I was leaving behind the first ever audax control I had visited. Ahead was really only one leg plus half a leg beyond, barely more than a regular club ride really. As well as reviving me, the nap had done the job for the weather too. Although it was still warm, the edge had gone from the heat of the day and the sun was beginning to dip. The wind had almost completely died too. The leg ahead was going to be much more pleasant riding. Time of departure from St Ives 17:07 – just an Argus to go! Almost straight out of the control several of us immediately missed the turn, the route being slightly different to the way in. By the time we reached the main road though, we’d all spotted the mistake, and as a small group we doubled back and swung left back onto the correct route. It took us much more through the middle of St Ives rather than around the town on the way in northbound. Somewhere along this stretch, Susan managed to snap the photo left capturing the beauty of the town. I vaguely remember seeing similar views when we also rode through, but I was chatting with the riders I’d met outside the control and obviously wasn’t paying proper attention. Once through the town we backtracked for a considerable way along roads from out route northbound, except in the still air and bathed in the light of evening air they looked completely different. For some reason I had imagined that as soon as we left St Ives we would split off onto different lanes from the way north, but it wasn’t the case. For many kilometers we passed sights I remembered from the way up: the campsite with closed-down golf shop where Emmerentia and I had stopped to fill my water bottles; and just beyond in the village of Haslingfield was the village shop we’d passed and that I’d wondered whether was open or had water. This time it most definitely was open – and was surrounded by a gathering of fellow LEL riders. A couple of kilometers back I’d ridden along and chatted with a chap who’s name I’ve now forgotten. On spying the shop I called out that I fancied an ice cream and was going to stop. Approving of the idea, he stopped also. The shop was a treasure trove of treats – including a freezer with those wonderful little tubs of ice cream with spoons in the lids. I also grabbed bottles of coke and water to drink now, and top up my water bottles. By the time we’d gathered up our goodies some of the riders outside were setting off again, and there was space on the benches outside to sit and enjoy the ice cream. The village shop was just across from a churchyard, in the middle of this quaint little village, shadows lengthening in the orange glow of the evening. It’s hard to convey the perfect serenity – an ideal setting to pause and reflect on everything LEL had been, and savour the moments before they were gone. Finishing my ice cream, I got up to top up my bottles and head off. As I was preparing to leave, a lady was arriving at the shop. She’d heard that extra help was needed with all the cyclists, and had come to keep the shop open a bit longer. Back on the bike, the road immediately turned right and up the short climb of Chapel Hill. I stopped at the top of the hill, partly to take a painkiller, but also to reassure my doubts. I was beginning to wonder if my GPS track was actually just retracing the northbound route, it seemed like the path should have split by now. Turning the route sheet on my handlebar though, the southbound leg had clear instructions this way. My riding companion from before the ice cream stop was amused to find me there, checking my doubts. He’d already re-assured me a couple of times we were on track. Not long after we passed through Barrington again – a few riders were stopped at the pub on the village green, enjoying their last LEL moments. A little further along, the split from the northbound route finally came, in the village of Fowlmere. Setting out on unfamiliar lanes, the route suddenly became more undulating – and stunning, golden fields of wheat flanking the lanes. The riding wasn’t just pleasant, it was glorious. As pleasant as it was, it was also starting to become rather challenging too – a rolling procession of short steep climbs, followed immediately by descents into dips. I started to feel a bit light headed and nauseous with the exertion and I remembering trying to work out if I was dehydrated, over hydrated, on a sugar high, or a low. My foggy brain unable to come up with an answer, I pulled over to stretch, eat and drink something. As I was stopped, Feline (real name Lara) and her riding partner went past. They had been stopped a little way back, and I seem to recall thinking they also appeared to be struggling along this unexpectedly tough section. The route planners certainly didn’t seem keen to let us off easily just because we were nearing the end – in fact at times it seemed like one last ritual that had to be endured before we were deemed worthy. 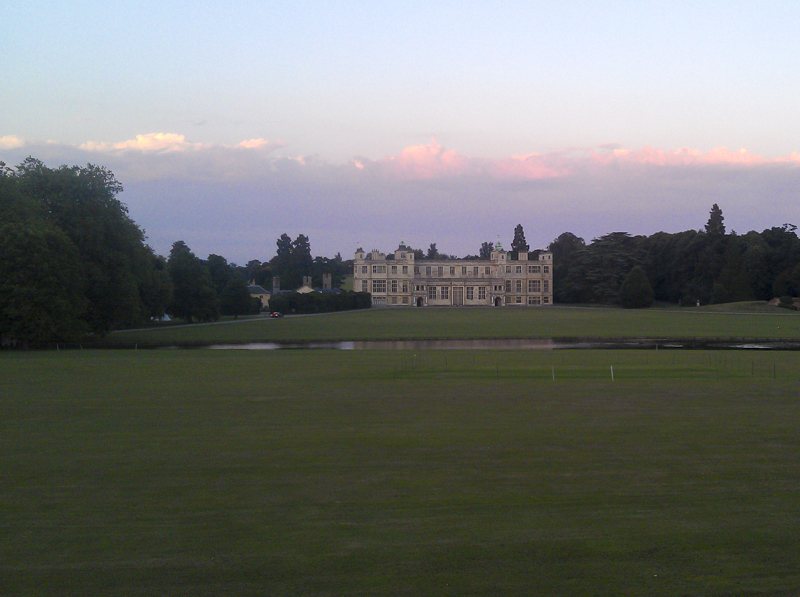 Someone later queried how they had managed to “find the Alps in East Anglia“. It was an exaggeration of the size of the climbs sure, but not their impact on tired legs. Rather worryingly a new ache had surfaced – I was now nursing a rather tight left Achilles tendon. The side of my shoe squeaked as it rubbed on my crank – I couldn’t tell if the cleat had slipped, the shoe lost it’s rigidity, or my riding position had shifted to mitigate the ever present neck pain. Never having had any issues in this area before, I was unsure if it would just be sore and ache for the rest of the ride, or if it might blow up completely, ending my ride. It was a worry, and I took it especially easy on the uphills – spinning my lightest gears, and avoiding any excessive force on either foot. The light eventually faded with only a few kilometers left of the leg. I put on the Lezyne just in case, but could probably have ridden to the control on the dynamo light alone. Great Easton sat ahead, at the top of one final hill, a beautiful old church floodlit just near the turn into the control. The control was like a kid’s party – plates and boxes of sweets, crisps and other treats covered every table. It was all rather surreal, and dreadfully timed on my part. Normally, I’d have been in heaven when faced with an array of salty and sweet snacks, but my contrary appetite just wasn’t in the mood. I went to the little canteen hatch to see what else might be available. Even more bizarrely, the offer of fruit salad which would normally have seen me turn my nose up, suddenly seemed to be exactly what I wanted. So much so in fact, that having polished off one bowl, I went back and begged another. A couple of coffees also went down, the sugar count in each now having risen to three – not bad considering I normally don’t take any. Fresh ham rolls came out whilst I was there too – a couple of which also ended up in front of me. Somewhere in the background, one of the film crews was conducting what must have been one of their last interviews. Nearby, Feline and her partner were sitting. I vaguely remember exchanging comments on how buggered we felt after the previous leg, and wondering how to muster the strength for the last small stretch. Yoli and I swapped a stream of messages whilst I was sitting there enjoying the atmosphere and hospitality. For one last time, I went through my control departure routine: power up Garmin and select next leg, except this time it was S9, the last on the list; stash brevet card, phone and other bits in bar bag; fill water bottles; and check over bike for anything looking worn, loose, or broken. Just 45km to go, with 4 hours before my cutoff. It was still more than possible to stuff this up with a mechanical, a fall or an injury – heck, even just a deterioration of one of my existing problems. Back home, Yoli was stressing too. She had been watching my speed slowly dropping, and to make matters worse she thought my cutoff time was 2am, when in fact I had almost an hour more than this. Unless the next leg was extremely hard, aside from a catastrophe, the job should be almost done. It felt premature to say it was all downhill to the end. Except, as it turned out, it was almost all downhill to the end. We had overcome the route planners last test, and our reward was a succession of wonderful, easy lanes, mostly downhill. The few times they did rise up, it was barely more than momentum alone could carry us over. I remember riding through the town of Great Dunmow soon after Great Easton with the stupidest of smirks all over my face. Luckily the town was mostly deserted by now, so there was no one around to witness this disheveled, smelly apparition, grinning like a deranged lunatic as they cycled through the town. They’d have probably fled in fright if they had. Pretty much my only challenge was staying on the bike. I was seriously sore by now, and adopting all sorts of weird riding postures to try and ease the discomfort. It was a lethal combination when mixed with winding lanes in the dark, and occasional rather odd hallucinations caused by the brightness of my lights amongst the tunneled banks of the lanes and arches of trees above them. On several occasions I found myself carrying far too much speed into a corner that I’d seen very late. Ordinarily, I’d just have leaned into the bend, but that’s rather hard when you’re sitting on the top tube not the saddle. I was bemused to find some fellow C group riders looking for a place for a nap. We did have time in hand, but oversleeping in a field so close to the finish would not be the way I’d want my ride to end. I tried to perk them up as I went passed, urging them to push on we were nearly there. I was beginning to think LEL was almost done when it threw one last surprise my way. I still didn’t have any distance indicators, but I must have been within the last 10km or so. The road had turned upwards for one of the few rises that actually required some pedaling and a change of gears. Ahead was a rider that I was slowly catching up with on the gradual incline. As the rider number came into view I did a double take – T45, surely not! It wasn’t a hallucination though, as I pulled alongside I heard a voice say “Hi Rob, it’s Phil“. I replied with something along the lines of “I know it is, I spotted your number, what a coincidence“. We’d swapped dozens of messages on a whole range of LEL topics. Phil had been partly instrumental in getting me to this point by helping me figure out how to use my GPS effectively, thanks to which at no time had I ever been remotely lost or off track. We ‘d only managed to meet up briefly once during the event. And yet here we were, enjoying an easy night time cruise to the finish. And along the way, Phil had unknowingly snapped a random photo of a dorm board that included my number. “Quantum weirdness” was the phrase he used to express this on Facebook. Definitely some form of strange entanglement. He wasn’t wrong. Quite apart from the rushing descent, which I took much more slowly than Phil, was an absolutely jaw dropping view – the whole of North London lay stretched out ahead, a massive expanse of floodlit metropolis carpeting every space to the horizon. We were almost there. Before long we were tracing the path of the M11, crossing the M25, and then the M11 itself. And then something I recognised almost at the exact time Phil mentioned it by name, Theydon Bois, literally a kilometer to two to go. For the first time I knew for sure that I was actually going to make this. It didn’t seem real – this ride had been in my thoughts for much of the last 15 months, but I don’t think I ever really believed I would actually complete it. 1,400km? Don’t be crazy! And yet here I was, here we were. “This is going to sound soppy, but it seems strangely fitting that we would meet up and finish this ride at the same time” I said to Phil as we turned through the last of the suburban streets. It didn’t need an answer. With a slight wobble on my part, we shook hands, and rode back into Davenant school where we had left just under 5 days earlier. LEL was finished, we’d done it! Despite being past one in the morning, there was a welcoming party there to greet us, cheering as we pulled up. Two volunteers caught each rider and bike as they arrived. It reminded me of helpers catching exhausted runners at the end of Comrades. It was a good plan here too, my legs almost gave way as I dismounted. “Let’s get you inside and stamped” the volunteer who had caught my bike offered. 01:28 - Rob Walker: Job done! 01:40 - Pixie: I want a photo of it around your neck pls! I think the photo that Phil’s wife snapped really does say it all – this was exactly how I felt at the end. Totally done. St Ives and wheat field photos courtesy of Susan Otcenas.